The preservation and incorporation of a portion of the existing Kahn & Keville building’s façade into the proposed development of a 121-unit building on the 500 Turk Street site isn’t simply for aesthetics. For as we noted yesterday, the existing L-shaped building on the site, which was constructed in 1935 and has been occupied by Kahn & Keville ever since, has been identified as a potential historic resource by the City. 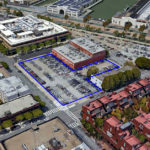 And as such, by incorporating a portion of the façade into the proposed development, it should help expedite the project’s approval or at least help mitigate a potential barrier. But alas, the formal importance of the iconic letter board sign on the corner, which has been adorned with quirky and inspirational messages for over thirty years, including today’s which is rather apropos, wasn’t deemed a “character-defining” feature worthy of being saved, the irony of which likely wasn’t intended. It’s always been about the sign. The rest can go. And I will miss the sign…. However time, development and progress march on. The property is too valuable for such a low-impact use. I’d hardly call it progress. 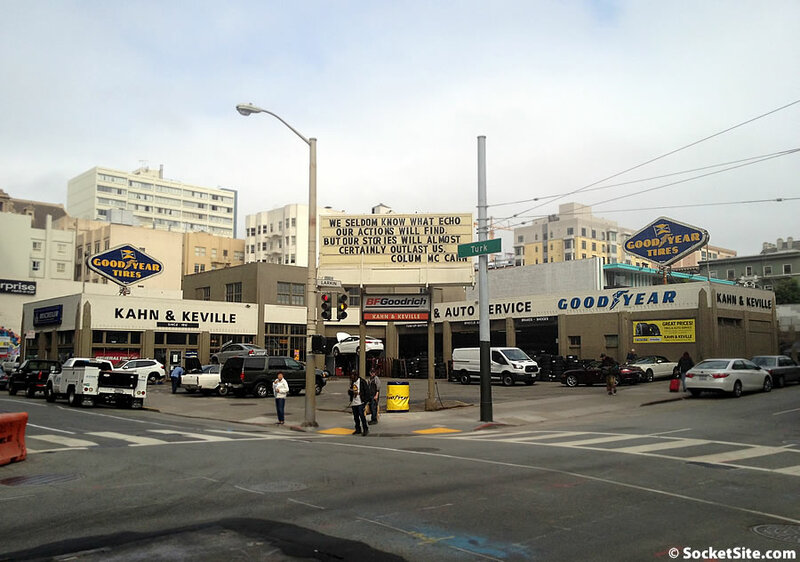 As for value, I guess then if the property value warrants condos over a tire shop then move all tire shops to one, more affordable location outside of San Francisco (because all land in our 7×7 is too valuable to support anything other than luxury condos). Then, when that land is deemed to valuable move them even further out. However, don’t whine when you get stuck in traffic driving to a tire shop outside of the city. Even expensive cities like NYC have low-impact businesses like tire shops because there is a need. You are so hilariously melodramatic. 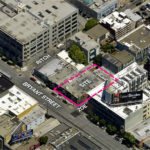 Please drive ten blocks of any street in the city and count the single-story, abandoned, parking lots, or entirely empty lots on both sides of the street. It is a hilariously large number for a city who loves to say “housing crisis” as much as we do. When even 1/3 of such lots have been (I think it’s adorable the hard-on the city has for preserving the façades of non-notable garages but hey, whatever floats your boat) developed with housing (preferably more than 3 stories; this is a CITY), then you are welcome to start worrying that there will be “no” tire shops, okay? And also, there’s no reason why you can’t have these types of businesses on the ground floor of a tall building, so believe me, where there’s suitable demand for auto shops, someone will lease out some space in whatever buildings are around (there are PLENTY), and run an auto shop there. That’s how they got to be there in the first place, not because some conservative (yes, that’s what I call people obsessed with keeping everything the same forever) specially reserved space for them. Good point… no reason you couldn’t have a tire shop or a mechanic operating on a floor of an underground multi-level parking garage for example. The sign is very cool. But once it’s a condo building, and the old facade is just for show, who would keep the sign updated anyways? It would become rather meaningless. This can’t possibly be serious, can it? The historic preservation movement in this city is intellectually bankrupt. A tire shop is a historic resource? Now I’ve heard everything!! Why the hate against tire shops? Who cares what kind of business it was (Chinese laundry, old school Italian deli, etc)? Disney’s made a tire shop an attraction in its throwback Radiator Springs, so obviously, some sort of nostalgia for auto-based businesses remains. But as for the historical resource argument–while the building does have some nice details, if you put a large complex behind it and keep the facade, it kind of loses its context and appeal. It’s not like they’re saving a large 1930’s Art Deco hotel or anything, that would maintain its own in a densifying city center. It’s a cool corner low-slung building that is cool only if it’s somewhere along Route 66 or something. This isn’t like London where they keep a four-story facade and build something modern behind it and keep the context of the streetscape going. This’ll be a one-story 30’s facade with some weird boxy six-story condo behind it. Then again, maybe the architects will think of something cool. And they’ll keep the sign under the 1% art tax and have some NEA-funded poet curate its quotes. The way the city wastes money someone could update the sign periodically, heck, local schoolchildren even. I like the sign myself, I’m thinking it could possibly be integrated into a new, and modern facade with relative ease (and if the project has a public arts requirement…well, it is art in a literary sense). I feel it’s historic to a degree; if the Tonga room was deemed historic then I’m thinking the sign might be also. Building should not be renewed, it should be re-tired. A BING and a BANG and a BOOM! There are cynics who don’t see that the sign has been read and appreciated by thousands of San Franciscans for decades. Those who simply write off the sign as insignificant just don’t get it, and I’ll bet they don’t miss the Doggie Diner dog heads or any other expression of individuality and showmanship by commercial establishments. That sort of coldness is sad. It’s probable that these people never looked up from their phone or from the dashboard of their car as they passed the sign. Or they are new to San Francisco. I have to admit that, since a big pole was placed directly in front of the sign, I haven’t been been able to read the sign from the 31 MUNI bus. I miss being able to see the pithy, quirky messages. Unless the sign is moved to one side or until the pole is moved (yes, this ain’t gonna happen), I wouldn’t be opposed to the sign being taken down so that dwellings on that block could be built. It’s block where menacing people lay around on the sidewalk wallowing in their own debris and spouting verbal filth at passerbyes, cars and each other. If you disagree with this opinion, go stand by that wall along the Phoenix Hotel for about 60 seconds any time of day. Bring a clothespin for your nose and have your Mace sprayer in the other. Say hello to the ranters and drug dealers for me. As the recorded MUNI message says, keep your eyes up and your phone down. The block needs some real foot traffic on that side of the street. Kahn & Keville building, I ate at Doggie Diner. I knew Doggie Diner. Doggie Dinner was a friend of mine. Kahn & Keville, you’re no Doggie Dinner.